Milk urea nitrogen (MUN) is commonly used by dairy producers as an indicator of protein utilization in the rumen of the cow. It is also correlated with the amount of urea found in blood and the urine. The relationship between MUN and urea excreted in the urine is linear over a wide range of MUN concentrations, and this relationship has been observed in both Holstein and Jersey cows (Kauffman and St-Pierre, 2001). Many countries use MUN as a reference for the amount of N excreted by the dairy cow (or a farm) for its environmental implications. With the importance of protein utilization on the production and financial stability of dairy farms and the emphasis today on the effects of agriculture on the environment, this study was conducted to investigate different non-nutritional factors that may effect the concentrations of MUN at the farm level. MUN was evaluated using Dairy Herd Improvement (DHI; provided by DHI Cooperative, Inc., Columbus, OH) data on 1325 dairy cows from 22 Ohio herds. These data were collected between January 2015 and July 2016. The data collected by DHI included herd number, cow number, breed, date of milk sampling, days in milk (DIM), milking frequency, milk yield, milk fat percentage, milk protein percentage, somatic cell score (SCS), and MUN concentrations. All of the variables examined were significantly correlated to MUN, but the correlation coefficients were low. The highest correlation with MUN was fat percentage in the milk, r= 0.18, P<0.0001. MUN was higher for three times-a-day milking with 14.62 mg/dL, versus two times a day milking with 11.12 mg/dL (P<0.001). It was also observed that the Jersey breed had a higher MUN concentration than the Holstein breed (P<0.0001) (Figure 1). MUN was also highest among the months of September through November and lowest among the months of March through May (P<0.0001) (Figure 1). MUN concentrations followed the lactation curve by peaking shortly after peak milk yield (Figure 2). An equation for calculating MUN using the variables presented was developed: MUN (mg/dL)=12.54+(DIM*0.001291)+(milk, kg/day*0.00284)+(fat, %*0.488)-(protein, %*1.0123)-(SCS*0.1462). Most of the results were similar to research conducted previously. According to Moore and Varga (1996), target values for MUN should be between 10 to 15 mg/dL, with the average concentration in our study of 12.54 mg/dL. According to Rajala-Schultz and Saville (2003), MUN concentrations were lowest during the first months of the lactation and the MUN concentrations peaked around the time of peak milk yield, which is similar to our observations (Figure 2). As reported by Wattiaux et al. (2005), Jersey cows have a higher MUN than Holstein cows, which is similar to our results (Figure 1). These authors also found that three times-a-day milking of cows results in a higher MUN than two times-a-day milking, which we also found with our analysis. Even with all of these similarities, there were some differences in that most of the research suggests that MUN concentrations are highest during the spring months (March to May), but within our study, we observed MUN to be highest during the fall months (September to November) (Figure 1). This observation may reflect that only few of the farms in our study may have been using pasture in the spring, or in other words, they likely feed a total mixed ration all year. With these data and other studies, it can be concluded that MUN concentrations can be affected by many different factors at the farm level in addition to nutritional feeding. In addition, MUN concentrations can also be predicted from several different production factors. MUN concentrations changed depending on the time of the year; cows in lactation from September to November had higher MUN concentrations. This does not necessarily relate to the intake of pasture in the fall because MUN concentration in the spring was among the lowest of the seasons. MUN increased with DIM as intake of protein increased and then declined at a slower rate than milk yield, likely because protein intake remained rather high during the time that its requirement was decreasing. Using this information and further studies can help dairy producers best maximize profitability and reduce nitrogen excretion into the environment. Kauffman, A., and N. St-Pierre. 2001. 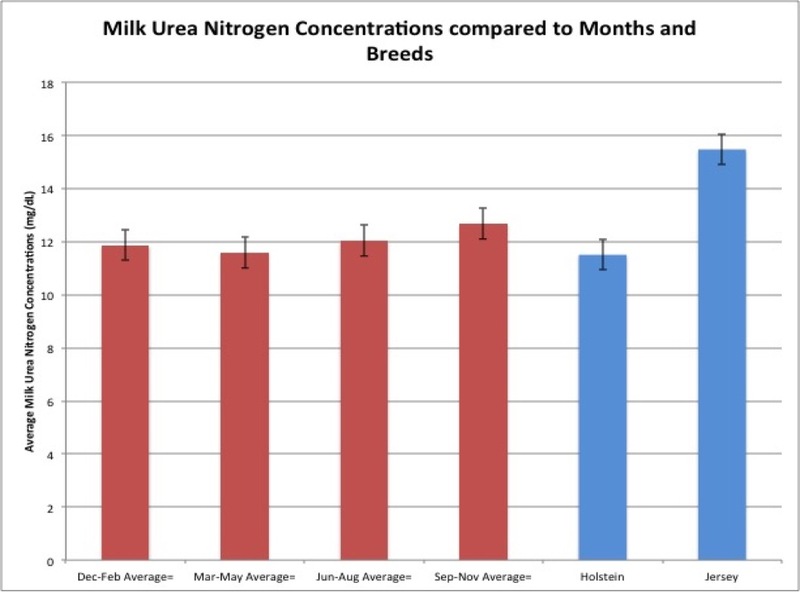 The relationship of milk urea nitrogen to urine nitrogen excretion in Holstein and Jersey cows. J. Dairy Sci. 84(10): 2284-2294. Moore, D.A., and G. Varga. 1996. 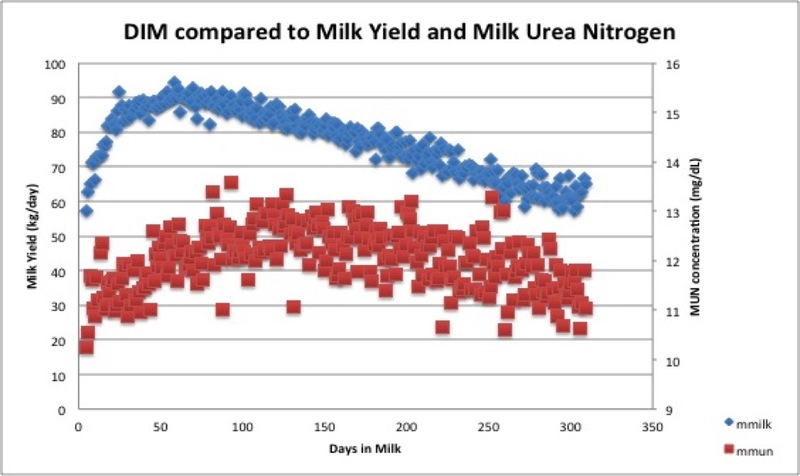 BUN and MUN: Urea nitrogen testing in dairy cattle. Comp. Cont. Edu. Pract. Vet. 18:712-721. Rajala-Schultz, P., and W. Saville. 2003. Sources of variation in milk urea nitrogen in Ohio dairy herds. J. Dairy Sci. 86(5):1653-1661. Wattiaux, M., E. Nordheim, and P. Crump. 2005. Statistical evaluation of factors and interactions affecting Dairy Herd Improvement milk urea nitrogen in commercial midwest dairy herds. J. Dairy Sci. 88(8):3020-3035.